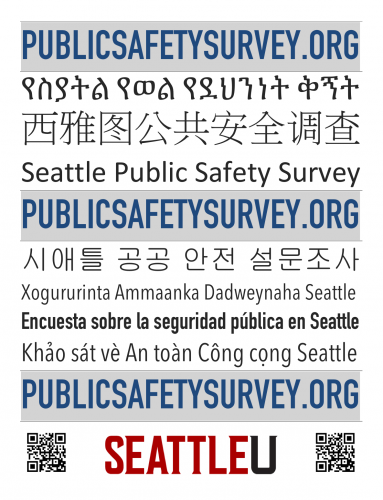 Seattle University is administering the citywide Seattle Public Safety Survey. The purpose of the survey is to solicit feedback on public safety and security concerns from those who live and/or work in Seattle. A report on the survey results will be provided to the Seattle Police Department to assist them with making your neighborhood safer and more secure. The survey is accessible at publicsafetysurvey.org from October 15, 2015 through November 30, 2015. Please circulate this information to your friends, family, co-workers and community members and feel free to post the information on your social media. Public safety and security are community concerns. Please make sure your voice is heard by completing the public safety survey today. Survey will be open from October 15 – November 30, 2015.